The wonders of amateur radio were discussed and celebrated in Mildura at the weekend. About 185 people gathered for the Wireless Institute of Australia's AGM, but it wasnt all business. Social events, including a civic reception and paddleboat lunch cruise on the Murray River,kept enthusiasts busy. The AGM is held at a different location every year and Michael Owen, president of the WIA, from Melbourne, yesterday said} Mildura's weather had turned it on for members - some of whom had travelled from New Zealand and Darwin. From Morse code to digital radio broadcasting, WIA members had the chance to share their knowledge and interests. "The weekend is a mixture of social, business and technical matters," Mr Owen said yesterday. "This morning a group from South Australia launched a high altitude balloon and tracked that using radio technology and a repeater on it; using communications as far away as Adelaide and Melbourne but using VHF;, so it's a mixture of all sorts of things involving 185 people." 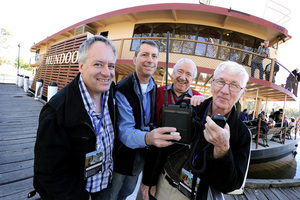 The wharf carpark was full of vehicles sporting transmitters and antennae and even while cruising the Murray River, WIA members held a radio broadcast, with some speaking to friends nationwide by using portable devices. "The conference yesterday (Saturday) was extremely successful,Mr Owens said. "The morning was addressing the various matters of interest that the Wireless Institute does as the national society for radio amateurs - its role there is a representation and advocacy role and in fact as representing radio amateurs, who are a service recognised by the agency of the United Nations, that deals with the co-ordination of the radio spectrum and we're also involved in contests and awards." The event ended with a farewell barbecue last night, but some members will stay in Sunraysia for the week. Sunraysia Radio Group secretary Noel Ferguson said the WIA was the representative body in Australia for radio amateur operators. "We have about 4500 operators in Australia and the equivalent in New Zealand and the president of that organisation also attended," he said. "We are all interested in radio, whether it be simply talking to people around Australia, or around the world, whether that be through satellite or radio communications. "It's also pretty social, it's given us the chance to meet people that we have spoken to, but never spoken to face to face and given us the opportunity to see the man behind the microphone." Story reproduced with permission from the Sunraysia Daily - Monday March the 28th edition.